French President Macron's Remarks About Africa Are Drawing Criticism From Africans : Goats and Soda In answering a reporter's question, the French president characterized Africa as a continent of failing states with high birth rates. Viviane Rutabingwa shares her perspective. French President Emmanuel Macron speaks a Press conference after a meeting of European Union leaders at the Chancellery on June 29, 2017 in Berlin, Germany. 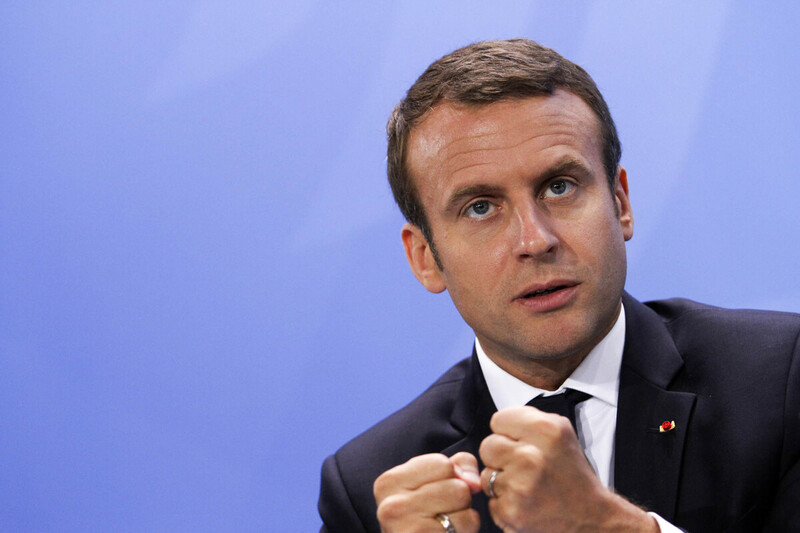 At a press conference at the G20 summit in Hamburg on July 8, French President Emmanuel Macron answered a question from a Cote d'Ivoire journalist. The reporter asked why there was no Marshall Plan for Africa. Macron's response included these comments: "The challenge of Africa is completely different, it is much deeper. It is civilizational today. Failing states, complex democratic transitions, the demographic transition." He later said, "One of the essential challenges of Africa ... is that in some countries today seven or eight children [are] born to each woman." Many commentators have called these statements racist, problematic and arrogant. And many of us Africans agree. The French colonial empire ruled over much of North, West and Central Africa from around 1830 until 1960. During this time, African peoples were labeled "French subjects" but as a rule could not own property or vote. By the time the last French colonial country — Gabon — fully gained its "independence" in 1960, France had left behind a legacy of colonization, slavery and pillage. President Macron, as the leader of France, speaks on the status of Africa with this backdrop looming behind him. In 1884, a French statesman and leading proponent of colonialism, Jules François Camille Ferry, stated: "The higher races have a right over the lower races, they have a duty to civilize the inferior races." He called it France's "mission civilisatrice" or "civilizing mission." That idea was at the core of French colonial ideology. And now in 2017, President Macron declares the problems in Africa "civilizational." It is concerning to see the casual manner in which a head of state can play into racist stereotypes of the African continent and African women. Africa is a continent of 54 dynamically different countries. Each of them — like any other country on earth — has strikingly different needs and issues to face — and a conglomerate of local individuals and organizations working hard to address them. When Macron in his comments refers to "failed states, complex democratic transitions, demographic transition, infrastructure, porous borders, drug trafficking, arms trafficking, human trafficking, violent fundamentalism, Islamist terrorism," he plays into the tiresome trope that "Africa is a country, everyone is poor and can't help themselves." Which country is he speaking of? Could it be Rwanda, one of the fastest-growing economies globally and a country that is always high up on the list of gender equality — almost 64 percent of parliamentarians are women compared to just 22 percent worldwide? Or perhaps is he referring to Botswana, which has demonstrated remarkable economic progress by jumping from a low-income to a middle-income country within a few decades. It has been discussed ad nauseam why the rhetoric that there's one story for all of Africa is damaging to the progress of African countries and the dignity of African people. And then there is the matter of children. Niger is the country with the world's highest fertility rate — 7.6 children per mother, according to World Bank data. But the number of children per African woman in many African countries is lower and is generally declining. The data in 2015 shows 3.5 in Namibia, 5.6 in Nigeria and 4.3 in Kenya (down from 7.9 in 1960). In 2015, on average, according to the World Bank, a sub-Saharan African mother gives birth to 4.9 children. I'm distressed by the ease at which this president throws out an extreme number to paint an inaccurate and stereotypical picture of African mothers. 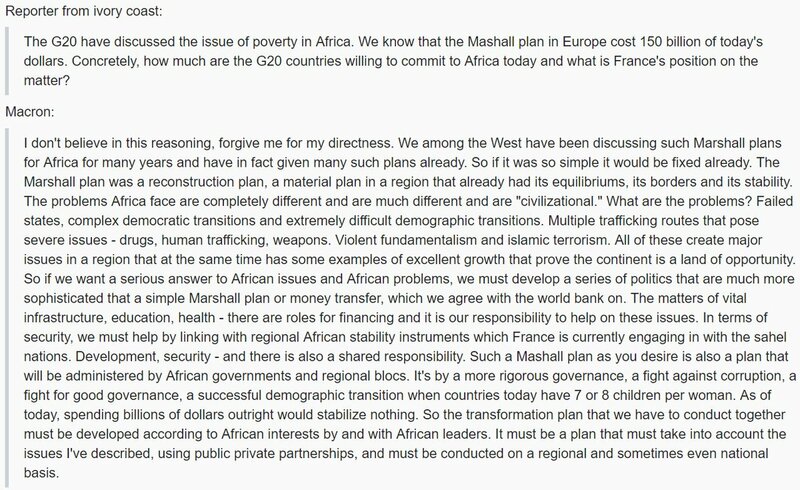 Despite my criticisms of Macron's comments, I do believe he made a pertinent point when he said: "If we want a coherent response to Africa, then Africans must develop a series of policies that are far more sophisticated than a simple Marshall plan." That observation mirrors statements made by African heads of state as well as many researchers and academics who have been pushing for alternative models to help the countries of Africa grow. In her book Dead Aid, the acclaimed author and international economist Dambisa Moyo observes that African peoples — for decades — have been pointing to the inherently ineffective and actually destructive nature of Western aid programs. Too often these programs bring in foreign personnel and do not invest in grassroots efforts. And they fail to recognize that one size does not fit all. Despite this bit of clarity, Macron's comments dig up the ever-hidden stems of old imperial notions. His words remind many of us Africans of the terror our ancestors and elders went through during the years of imperial rule. And yet I'm not entirely sorry that Macron said what he said. His comments were a much-needed reminder that we must keep demanding accountability from imperial nations — a goal that President Macron himself seems to agree with. In a speech in Algeria in February, he called colonization "a crime against humanity." Viviane Rutabingwa was born in Nairobi, Kenya, at the twilight of the Ugandan civil war to Ugandan parents and grew up in Kenya, Burundi and Uganda. She now divides her time between Uganda and Canada. She is a public health professional with a focus on the uninsured and refugees and a Global Health Corps alumni. She tweets @Rootsi.